You have a HUGE impact on this effort and we humbly thank you for all you give. Sneak Preview of Art in the ISSUES show! Issues, we all have them, some we let people see, others we keep buried inside. 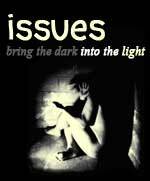 On September 16-18, 2011, Issues is an Art, Fashion, Film, and Performance event, featuring local and regional talent with the goal of bringing their Issues from the dark into the light, and putting it on display. A chance for the hidden to be shared, contemplated, and even celebrated. Issues will feature both established and new talent. The event is a forum for all types of art and talents to be experienced together and provide a glimpse into the creative cross section of our area. Issues is part of series of events put on by EVENTgelical Productions Inc. We are a not-for-profit organization that fosters awareness and appreciation of all types of art, by providing display and performance opportunities to established and new, local and regional talent; through a series of themed events held throughout each year. We combine aspects of the current, established creative presentation outlets; the gallery, the recital, the reading, the runway show, etc, into singular unique events that are designed to engage the audience and grow cross-media/creative outlet appreciation and inspiration.